The Chart Tools—Format tab, as shown in Figure 4, enables you to apply formatting to specific chart areas, such as the axes, legend, gridlines, and series. Figure 4. Apply subtle or sophisticated formatting on the Chart Tools—Format tab. Select the area of the chart you want to format from the Chart Area drop-down list on the Chart Tools—Format tab. Select the chart area you want to format from the menu. The options that appear in the menu vary based on the chart type. For example, a pie chart doesn’t have axes. Click the Format Selection button to open the Format dialog box. Again, the exact name of the dialog box and its content varies based on your chart type and what you selected to format. 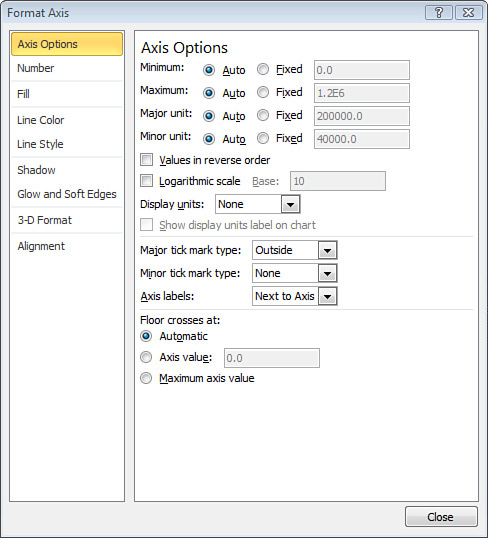 For example, Figure 5 shows the Format Axis dialog box, which opens if you choose to format an axis on a bar chart. Figure 5. The Format dialog box takes many forms, such as the Format Axis dialog box. Specify your formatting changes in the Format dialog box. Click the Close button to apply your changes, and return to your chart. The Chart Tools—Format tab also offers features shared with the Format tabs that appear in context when performing other tasks in PowerPoint, such as applying shape styles and WordArt styles and arranging chart elements.